Information sign on the Passage West and Monkstown Railway Trail. From 1815, the towns and villages of Cork Harbour were linked by a river transport system which carried passengers and goods between Cork City, Passage West, Glenbrook, Monkstown, Ringaskiddy, Crosshaven, Cobh, Aghada and Ballinacurra. This was a service of small paddle steamers owned by the ‘City of Cork Proprietors’. By 1836 there were five boats operating and many thousands of passengers were conveyed. The journey of twelve miles from St. Patrick's Bridge, Cork, to Cove (Cobh) lasted one and a half hours and the fares were nine pence cabin and sixpence deck. All vessels (listed below) called both ways at Passage and Monkstown piers. ‘City of Cork’ 1815-1850 50 gross tons 18 h.p. ‘Waterloo’ 1816-1850 50 gross tons 50 h.p. ‘Lee’ 1830-1840 87 gross tons 40 h.p. ‘Air’ 1836-1840 70 gross tons 60 h.p. ‘Eagle’ 1838-1851 120 gross tons 60 h.p. Following the opening of the Cork, Blackrock and Passage Railway in 1850, the service initially enjoyed great success. However, because of the distance from the city centre to the terminus at Victoria Quay many potential passengers continued to avail of the traditional steamer service provided by the River Steamers Company (R.S. Co.) which could be boarded at Merchant's Quay in the heart of the city. Relocating the city railway terminus became a priority and plans to extend the line further downriver were shelved because the future of the railway depended on providing a ready access from the city. The directors were fully aware that the viability of their company depended on its ability to provide a full service. Faced with this reality, a new river steamer was ordered to ply the river between Cork and the harbour towns. On Sunday 13 July 1851 the CB&PR's first steamer, Queenstown, went into service, linking Cork with Passage, Monkstown and Queenstown. The introduction of the ‘Queenstown’ saw the beginning of serious rivalry between the competing companies. There were three different steamboat companies now operating in the harbour. This led to open 'warfare' on the water as steamers raced each other to arrive first at the various piers. Several accidents occurred, including quite a few collisions. When the railway was extended to Monkstown in 1902, the steamer service terminus was moved from Passage to there. Even after the line was extended to Crosshaven in 1904, the river steamers continued to provide a link between the eastern and western sides of the harbour. The first strike by railway workers in the history of the C.B. & P.R. began on 29 January 1922. However, the strike had little effect on shipyard workers travelling to Passage because the management of the local Royal Victoria Boatyard provided a special boat service for its employees. On August 8th. 1922, in an effort to halt the advance of Nationalist forces, a span of the Douglas Viaduct was blown up by Republicans, bringing rail services to a complete standstill for eight months. Apart from other considerations, the stoppage of rail services caused unemployment of many of the old CB&PR staff members, with consequent great distress. 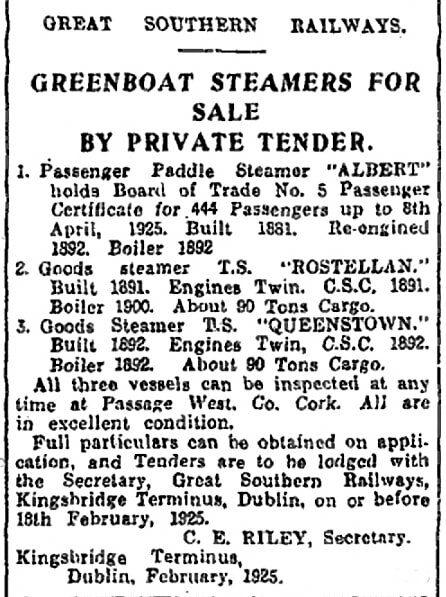 However, the steamer "Hibernia" was hired, and with the "Albert" a river passenger service was instituted between Cork and the various lower harbour piers. A second goods vessel was also introduced for the convenience of traders. This arrangement continued until hostilities had ended and rail services resumed following the construction of a timber bridge as a temporary replacement for the dislodged span of the Douglas Viaduct. By the mid-1920s, the steamer department of the Cork, Blackrock and Passage railway, with the inevitable maintenance and renewal of vessels, began to prove a financial millstone around the company's neck. The river services finally ended in 1927. The CB&PR steamers were disposed of at intervals from 1925, the first to go being the SS Queenstown, which was sold in July of that year. Next year saw the sale of the SS Rostellan to Joseph McSwiney of Passage, and finally, in 1927, the veteran paddle steamer Albert was towed to England for breaking up. From the Cork Examiner - 25 Feb. 1925.